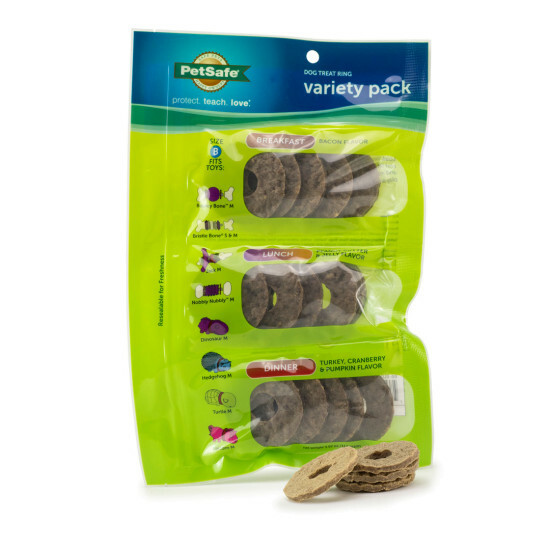 Treat your dog to a feast with the PetSafe® Breakfast, Lunch and Dinner Treat Ring Variety Pack. These delicious treats come in three different flavors-maple & bacon for breakfast, peanut butter & jelly for lunch and cranberry, pumpkin & turkey for dinner. The Breakfast, Lunch and Dinner Treat Rings are made from natural rawhide and tested for quality, safety and health. The treat rings are designed for use with select Busy Buddy® toys, including the Bouncy Bone™, Bristle Bone®, Nobbly Nubbly™ and Jack.